In 2007, Gophers standout Kyle Okposo decided midway through his sophomore year to turn pro. It was a strange decision and strange timing. Then things got stranger. 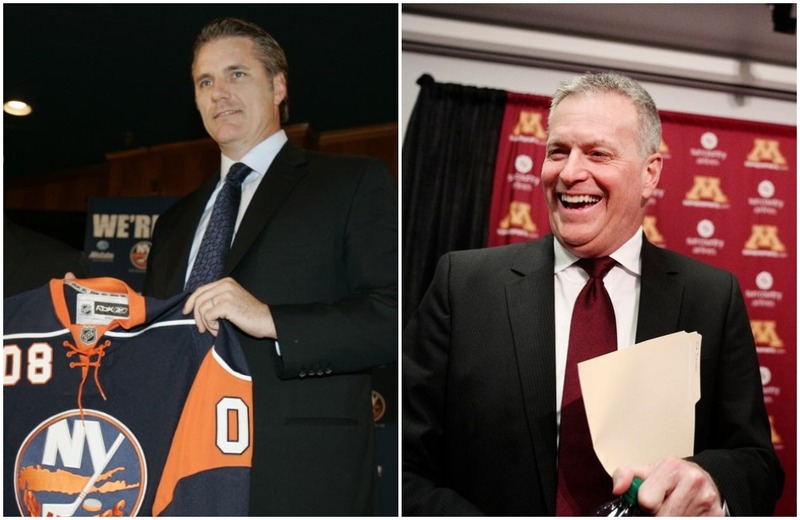 If Don Lucia had known he was this close to outlasting a strange nemesis — Islanders general manager Garth Snow — would he really have decided a couple months ago to call it quits as Gophers men’s hockey head coach? I kid, of course, since Lucia’s departure and the news Tuesday that Snow has been fired by the Islanders are mutually exclusive events. But the proximity of timing of both events is cause to remember the strangeness that forever linked the Gophers and Islanders a decade ago. In December 2007, Gophers standout Kyle Okposo — the No. 7 overall pick of the Islanders in the 2006 draft — decided midway through his sophomore year to leave Minnesota’s program and turn pro. It was a strange decision and strange timing. But things got REALLY strange when Snow started offering unsolicited critiques of the Gophers and Lucia during a phone interview with the Star Tribune’s Brian Stensaas. It got even more personal as the call continued. a coach there that looks in the mirror,” Snow said. Okposo had a strong freshman season, compiling 40 points in 40 games, and had seven goals with four assists in 18 games as a sophomore before pulling the plug. I can still remember being in the newsroom when Stensaas was on the call and whistling in disbelief as he relayed the quotes to me after it was finished. The Islanders’ Chris Simon had recently been handed a 30-game suspension, leading to speculation that the organization’s sudden interest in having Okposo turn pro was motivated by roster need more than any honest criticism. Joel Maturi, Gophers AD at the time, basically said as much. Okposo has gone on to have a solid NHL career, mostly with the Islanders and the last two with Buffalo, scoring at least 18 goals in seven different seasons. Okposo appeared in the playoffs in just three of his nine season with the Islanders, and New York reached the postseason just four times (advancing to the second round just once) during Snow’s tenure, which began in 2006. Okposo’s departure from the Gophers — combined with some other early high-profile losses — hurt Minnesota. The Gophers lost in the first round of the NCAA tournament the year Okposo left and missed the tourney the next three seasons after that before stabilizing with five tourney berths (and two Frozen Four trips) in Lucia’s final seven seasons. If anything, it would appear Lucia has one significant edge in this rivalry of sorts: He was afforded the opportunity to exit on his terms, while Snow was fired with four years reportedly left on his contract. Maybe Lucia can give Snow a call and offer some advice on how to handle sudden hockey unemployment.